I bought a watch this week. It’s simple and pretty and it tells time. Time flies. Don’t waste time. Time marches on. Time stands still. There’s no time like the present. I bought a watch this week even though for 40 years I’ve never worn one. Well, there was the brief time in middle school when Swatch watches were super cool and I had a black one. It meant I belonged, that I was Somebody. 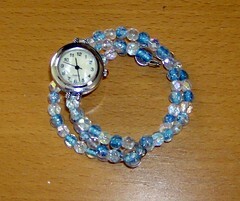 I bought a watch this week that I already don’t like, though its sea-glass colored beads are beautiful. I bought it because I am Somebody; I am Aidan’s mom. It keeps surprising me what that requires. When Aidan was in the hospital I had to take CPR, not because it’s generally a good thing to know, but because I’m Aidan’s mom. There’s no time like the present. Better to be prepared, just in case. When Aidan came home from the hospital, being Aidan’s mom meant I needed to know how to work feeding and oxygen machines, certainly not difficult tasks, but crucial in being able to care of my baby at home instead of the hospital. After two years when we didn’t need the machines anymore, time marched on. Aidan grew and got stronger and smarter. We spent years working hard and celebrating his progress. Then Aidan was diagnosed with Epilepsy. It was just a new medical issue to learn about. There was so much information to take in, but his seizures were mostly just strange in the beginning. Then they became stronger and I learned more. They were only lasting about 20 seconds each this past summer. His seizures continued to change. Now they sometimes last 2 1/2 minutes. That’s no time at all. Two minutes is how long it takes to wash your hands before entering the NICU, or brush your teeth, or cook a pancake. I bought a watch this week because in 3 minutes I need to be prepared to stop Aidan’s seizures before they become life threatening, because I am Somebody; I’m Aidan’s mom. I need to be prepared to give him rectal rescue medicine and I need to know how long 3 minutes is. Time stands still. That doesn’t feel like my job. It doesn’t belong in the same place as reading stories or tying shoes or giving baths, or tucking in, or giving eskimo kisses. I bought a watch this week because I need to be prepared to save my son. Don’t waste time. You are such a good writer, but I am sorry you need to write this. Does his color change? How’s the remodeling going? My swatch had clouds on the face and a clear and light blue band. My former Somebody rocked that watch…at least in her mind. I hate your beautiful watch too. I’m behind you in the journey of special needs mom but I can relate to your struggle with our expanded definition of mom. Beautifully said. Such powerful writing, Heather! I love the way you weave in all the old maxims about time, showing what they mean to you now. My favorite line is, “I am Somebody.” Yes, you are. Oh, Heather. I wish I could really know how all this must feel but I know I don’t have a friggin’ clue. Thank you for sharing this with the clueless who never really knew how lucky we are – so we can have an inkling and bow down in gratitude for what we’ve been spared. Love you and look forward to meeting your family someday. Wow. Perspective is everything. 🙁 Sorry this is how you have to view time now, but it’s good that you can. Blessings to you.